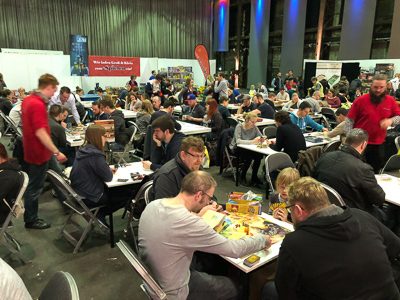 SPIELdoch, that´s a new game fair for the public. 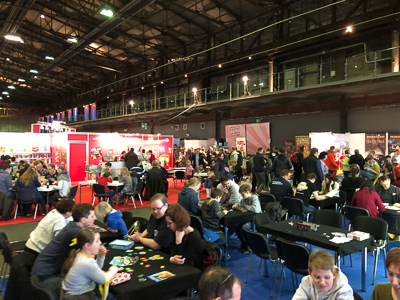 It takes place in the industrial city Duisburg, close to the Dusseldorf airport and next to the SPIEL city Essen. 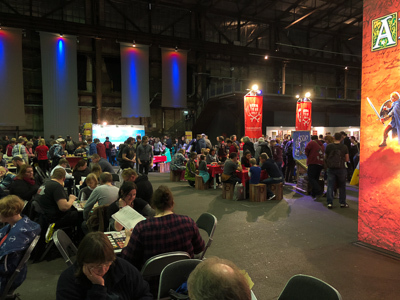 It is organized by the Nostheide Verlag that also publishes German's biggest game magazine. 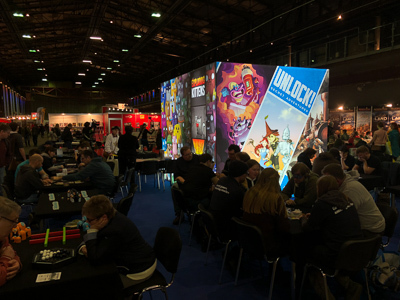 70 exhibitors are presenting their games and game novelties of this spring. 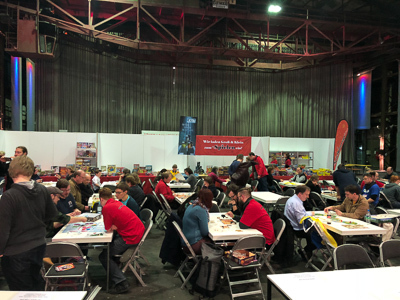 Of course this is not comparable with German's biggest fair in Essen, but next to some smaller publishers, nearly all big companies from Germany have come. But of course, we hadn't come to learn more about the industrial past, we wanted to play games. By the way, we, that are Ralf and Lutz for this fair. Let's try to deliver a picture from us later in this report. 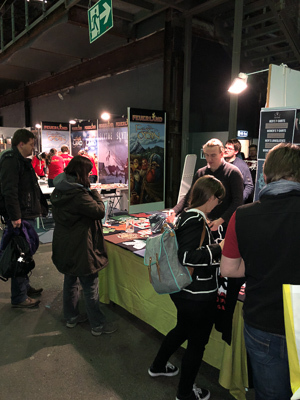 Our first stop took place at the booth of GAME FACTORY. Here we tried two smaller games. The first one is called Dragonwood, one of their older games. 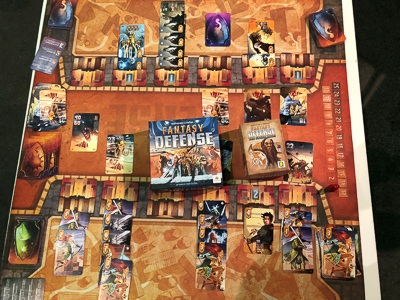 In the game, players collect sets of adventurer cards to attack and capture enemies from five available cards. These cards all have their own strength and a player must choose one of three disciplines to defeat them. If a card is captured, it either contributes to the player's victory points or can be used to improve the player's attacking powers. The game played smoothly with no deep depth. We think it is good for a family game, maybe to introduce children to the fantastic theme in the game world. Stack-A-Biddi was more a game for our age. 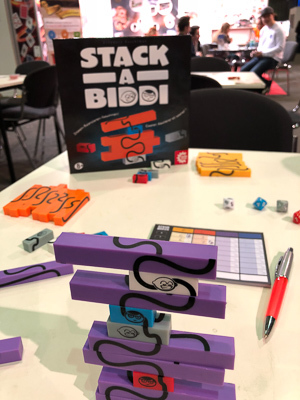 In this game 2-4 players simultaneously try to build up a stack of 12 different blocks. Four dice determine the position of the four shorter blocks, called biddis. What seems to be easy enough, turned out to be really annoying, because a black line on each block must be connected up the face of the blocks. And unfortunately, this line is not straight. As a result, you are often forced to stack the blocks at the edge, so that the balance of the construction is hard to control. As players compete against each other, time is a limiting factor. It was a great fun to play the game, although Lutz gave up after half part of the game. After this exciting experience, it was time for a coffee (although sleep was not really a threat after this game). 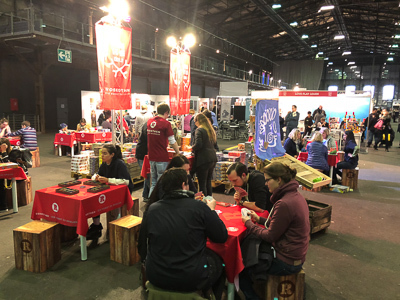 Filled up with coffee and new energy, we could risk to join a remarkable motivated demonstrator at the booth of APAS. 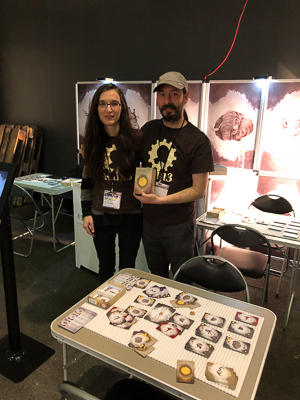 We were joined by one of the authors, Anselm Ostertag, by the way the brother of Helge Ostertag, the designer of Terra Mystica and Gaia Project. In Wulong players roll dice, bluff and wager what other players have rolled. The dice roll determines the income of the player, but only as long as he rolls the right results. While the other players place a bet on the throw, the player in turn may roll as long as he does not have a miss. Of course a miss ends his turn without any income. The other player either can bet on a range of income or they think that the player will end up with a miss. As you can imagine this results in a lot of bluffing and talking. But Wulong is more than that. With a clever tactical understanding you can bet an all-in while betting and with a little luck, you can easily catch up with the leading players. We had a lot of laugh, mainly because of the funny booth staff and the entertaining way of playing. 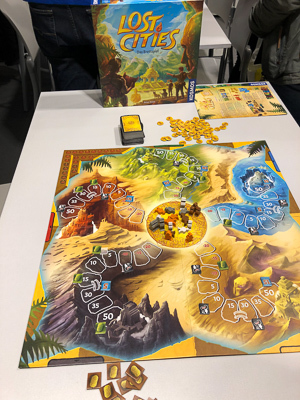 Last but not least on this first day, we had an introduction to Serengeti – A race for life by the small publisher HAL-13. The game got our intention because of the detailed and realistic artwork that was also presented in a huge art book at the booth. The game itself is about the African savannah and its animals. Two players compete to preserve the last species of the continent and for that they first have to learn more about them. The animals, in form of cards, must be collected by the players and can be used in various ways after that. In a kind of deckbuilding mechanism the players can add new animals to their deck. In the end it is not important how many animals a player has in total. Only the majority of each kind determines who gets victory points. Next to this simple collection mechanism, there are several other ways to compete your opponent and to score in the game. The author Rogue Marechal explained that the game is very tactical and that you have to adopt your strategy continuously during the game. After a long evening of typing and talking, we arrived a little bit later this morning than planned on our second day at SPIELdoch18. First impression: lots of folks in here today compared to yesterday! Maybe the reason for this is the start of the Easter holidays and a lot of families used the fair for their first holiday event. On the one hand this is just great for the new fair, because a convention without people isn't really that fun. 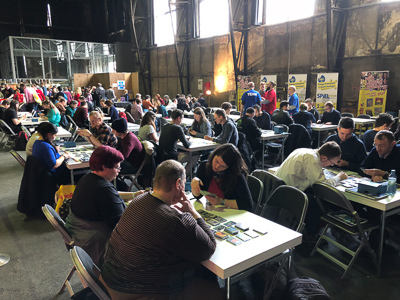 On the other, for us reviewers this is kind of a problem, because it wasn't to easy to find a table to playtest the games this morning. 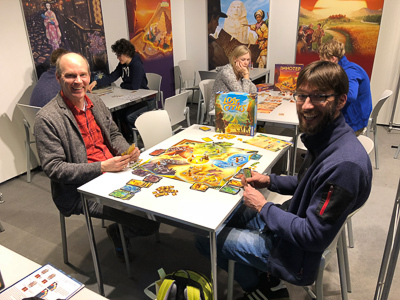 After some rounds through the hall we luckily found a place at KOSMOS where we had the chance to play the new Lost Cities – The Board Game. 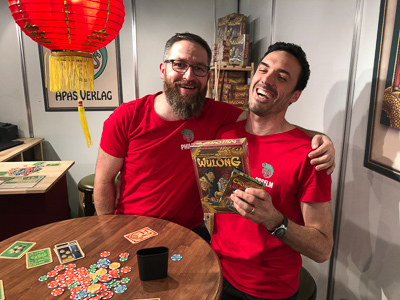 It is already some years ago, when the German publisher brought out the great two player game by Reiner Knizia. Next to a reprint of the original card game, the new board game and a “To Go” variant is available from KOSMOS. But the board game is not not completely new, because it is already available in the USA for several years. In the game, the players send their five adventurers out into the wild in order to find the ruins of five lost cities. There are five trails; each of them leads directly to a ruin after nine steps. On their turns, the players are allowed to play one card in order to move an adventurer one step closer on the path with the corresponding colour. The only condition imposed on the undertakings is that the cards are played in ascending order for every colour. So, a player has to seriously think about skipping numbers, because there is no way back and there are only cards with numbers from 1 to 10. 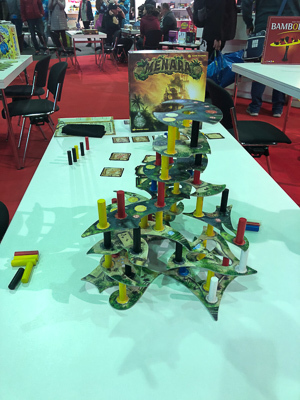 After an exciting race along trails through lava, water, rocks, desert and jungle, we came to the conclusion that we already know most of the game: The mechanics are more or less the same than in Keltis. The difference is the thematic setting and some minor details. However, Lost Cities – The Board Game seems to be the more complete game, if you compare it to the base Keltis game. So from our first impression it can be recommended for players who don't have Keltis and for those who already possess it, love it, but do not have the expansion yet. After this first try Lutz found a place for his bargain, and we had easier access to the free places. 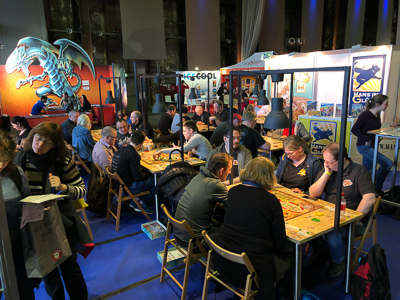 This gave us the opportunity to speed up and find a table at the booth of ASMODEE where we found the very promising Decrypto, also published by IELLO, PORTAL GAMES and LE SCORPIAN MASQUÉ. The German version will be published in two weeks, but at the fair the already had a first copy to play with. In the game, two teams compete to unlock the other team's coded messages. At set-up four cards are put in four slots of a screen for each team, revealing four items. The slots are numbered from 1-4, this is later the code to decipher. 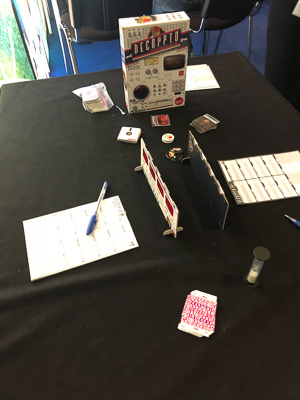 On a turn, one team member of each team draws a code card with three three-digit codes one by one and hidden from the other team (as well as the team screen). Then the player gives a hint word for every of the three numbers on the code card, which has to do with the corresponding word on the team's screen. For example our opponents chose lace, womanly and fabric for the item underwear. Both teams, the own one and the opposite one, must guess the right code after this, but with the difference, that the own team can read the words on the team's screen and the other on not. As a result, the first guess of the opponents team can only be a quick shot. But later on, the guessing becomes more precise, because the players already know that lace, womanly and fabric have to do with – let us say – the second word on the screen. So, if in the fourth round the word clothes would be named, the code for this word could easily be deciphered. Misses and correct guesses are tracked for both teams and the first team who unlocks two codes wins the game. If however the own team members have two wrong guesses (the own team can be wrong too, although they can see the screen), this team looses. We had much fun playing the game and think that Decrypto is a great guessing game. 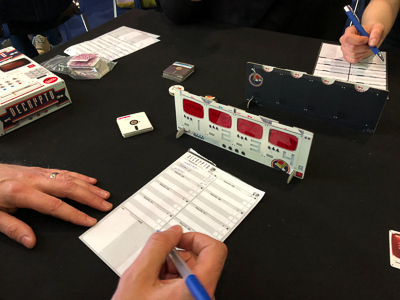 Even the two demonstrator who played the game with us were fascinated by our discussions during the game and the enthralling decryption process. Definitely one of the highlights of the convention! Topito was the other game we played at the booth. 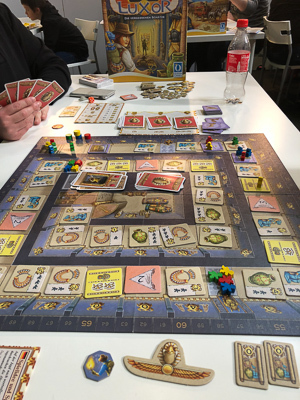 Basically this is a lighter version of Meeple Circus, reduced to the main mechanism of stacking and moving wooden animal and worker blocks from one space to another to match the player's card objectives. 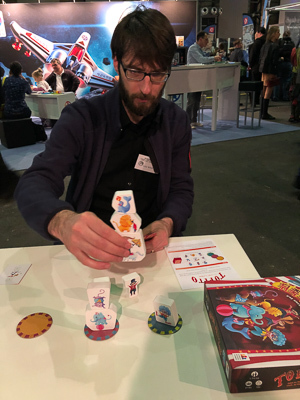 Unlike the other game, in Topito the players take turns one by one and with the same game material. As a result you can destroy other player's plans by moving a stack of artists to another place. Nice game, especially with smaller children it should be worth a try-out. But now it was time to act as part of an expedition once more. In Luxor – Forgotten Treasures by QUEEN GAMES the adventurers hunt for the treasures to be veiled on the corridors of the legendary temple of Luxor. Players move their adventurers by playing cards in order to reach the Pharaohs tomb chamber step by step and collect the precious riches on the way. But players are not allowed to change the order of the cards in their hands and play the cards as they want to. It is only allowed to play the leftmost or rightmost card in your hand. Additionally a new drawn card must be placed in the middle of the four cards remaining. This brings a little tactical aspect in the gameplay. In some kind of way you are forced to plan your next moves, because otherwise you end up with two cards at the edge you cannot use. Furthermore a player can´t use all adventurers at free disposal right from the beginning. Only if one of their adventurers moves past an Anubis statue where one of his inactive adventurers is still lying down it becomes active. Because of that the race to the Pharaohs tomb is getting more suspenseful round by round. But what is the aim? On our way there are multiple ways to score, collect items for the final scoring and immediate effects. The idea is to reach certain spaces with one or more adventurers before the other players, because a lot of of destination are taken out of the game after they have been collected. The final field is the inner of the temple, which brings players additional victory points, but it is not necessary to be there first. In reality, Lutz won the game without reaching this final space. Luxor – Forgotten Treasures is a typical adventurer hand management game. 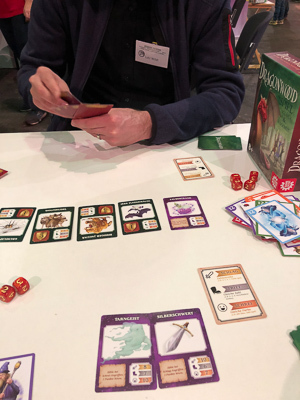 Experienced players might be a little bit disappointed because of the lack of really new ideas in the game, but occasional gamers will find a very good game that should offer enough varieties to withstand the one or other evening. 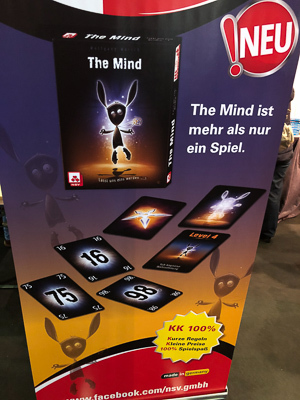 This leads us to our final game at the convention: The Mind by NÜRNBERGER SPIELKARTEN VERLAG, a small card game, currently in the Hotness of BGG. Empathy is the word you need to describe the game mechanism. In the fashion of The Game 2-4 players are asked to play cards in ascending order. In The Mind all players the cards are played on a single pile. The game starts easy. In the first level every player just gets one card. Then the players look themselves straight in the eyes and without speaking a word determine the right moment to play the card. In the next level, two cards are dealt to every player. This continues up to the 12 level. If there is a mistake in the ascending order, players loose one life. Does this really work, you might ask? And if it does, how? Exactly, the answer is empathy. The Mind is not a typical game, the publisher calls it an experiment. But it is great to take part in it. We both did a good job and reached level 9. With a maximum game duration of 20 minutes and the low price, The Mind should be in everybody's game collection. At least that's what we are thinking after our first play. This last experience ends our visit of the convention for this year. Let's have a last look at the tables from HANS IM GLÜCK, where we had no luck to find a table to play their new Race to the New Found Land. 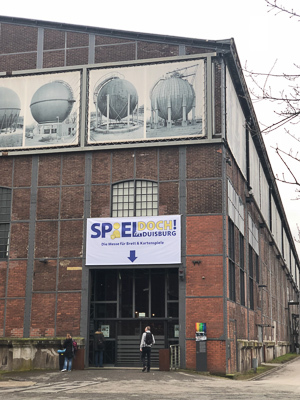 The first SPIELdoch was a great success according to the organiser. 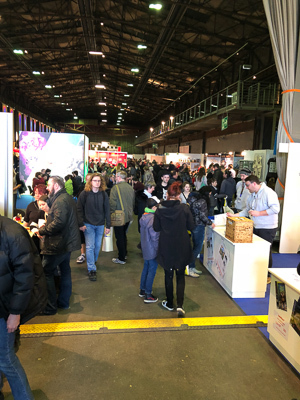 Over 10.000 visitors came to the historical hall. The G@mebox crew spent some very amusing days at the convention, so we definitely will return in the next year. We hope you enjoyed our coverage, let's see next year again. 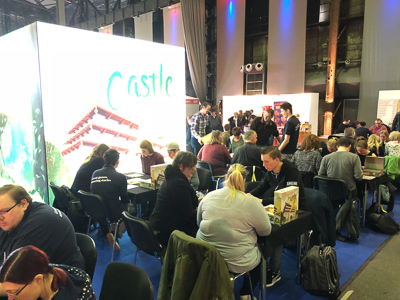 Stay tuned for the reviews to come and of course our big coverage from Essen later this year.